“Tite can look for another captain” – After ending Brazil’s wait for Olympic gold in men’s football, Neymar opted to relinquish the armband. NEYMAR HAS ANNOUNCED that he will step down as Brazil captain after guiding the country to the long-awaited Olympic gold medal at Rio 2016. 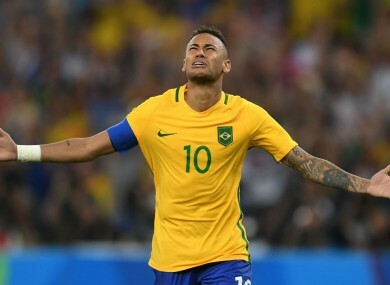 Appointed captain of the senior team by Dunga following the 2014 World Cup, Neymar also skippered the largely under-23 side at the Olympic Games on home soil. The gold medal remained the only international honour evading Brazil, and the 24-year-old clinched it with the winning penalty in a 5-4 shootout victory over Germany. Neymar’s spot-kick sparked scenes of euphoria inside the famous Maracana, but it did not stop the forward revealing he no longer wanted the armband. “I do not take it as a burden, it is you [the media] who put it on me,” Neymar said in an interview with SporTV. Today I have become a champion and I give up the captain’s armband. It was something I received and honoured with affection. Neymar has won the Champions League with Barcelona, the Copa Libertadores when at Santos and the 2013 Confederations Cup with the national team. The forward was unable to rank his gold medal among his achievements, but he was relieved to have added it. “I do not like to put one title above the other. Every competition I contest and win is important. Of course, it had great importance to Brazil and thank God we did it – after a lot of struggling, work and concentration,” he said. Email “Neymar steps down as Brazil captain after Olympic triumph”. Feedback on “Neymar steps down as Brazil captain after Olympic triumph”.